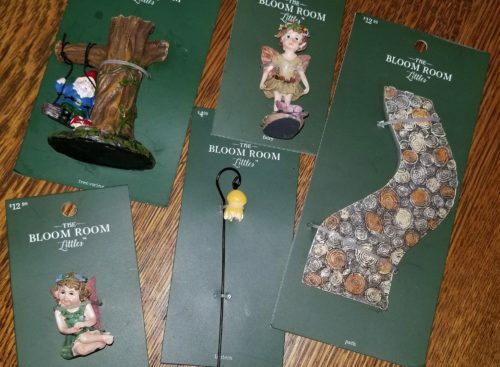 I got a message from my niece Jody and she asked, “Are you still doing fairy gardens?” Well, yes I am. I thought it was an odd question as no other conversation happened after that. 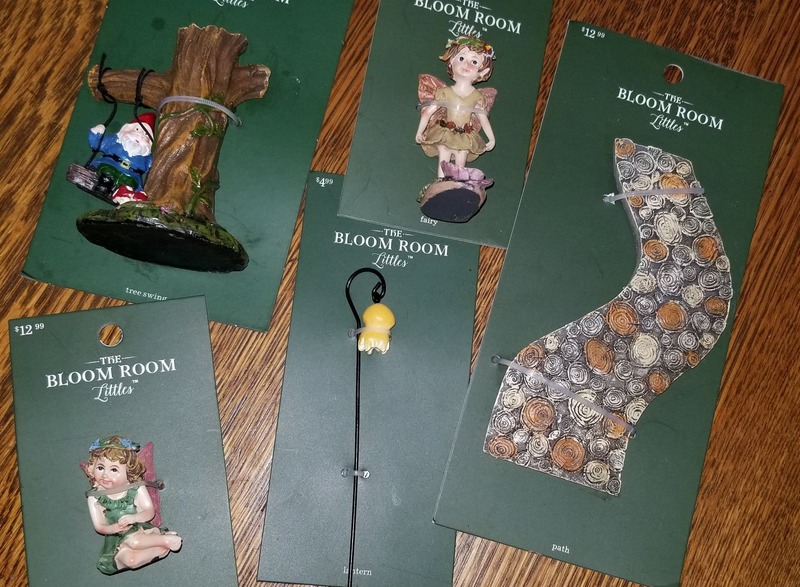 Then a couple days later in my mail came a package with fairy garden goodies. Yes, Jody is sweet like that. Aren’t they cute? Jody said her favorite was the troll on the swing. I like him but something I could really use is the stone path. I am planning on making another fairy garden and I think it’s going to go by the garage entrance to the house. I’m in the market for a new container. I love all the goodies!! Thanks Jode. Next came a package from blog reader Charlotte in MO. I sent a charity quilt to Charlotte to bind. She ended up sending me a check to cover postage (very appreciated but not necessary) and stickers for the kiddos. The ones on top are their favorite. 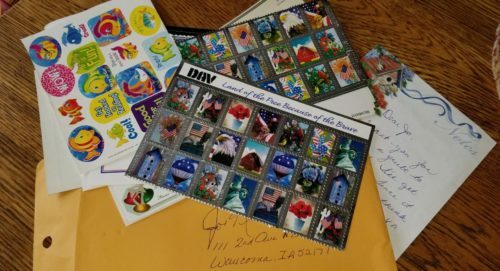 The look like real stamps to the kids. This was super thoughtful Charlotte. THANKS! Next up from LaNan in NW Iowa. She was shopping at her favorite quilt shop Crafty Corner in Worthington, MN at their huge annual sale. She ended up buying this bolt of fabric for $1 a yard. (No wonder she loves the sale and the shop) They didn’t unwind the bolt but guesstimated it to be 11 yards worth. LaNan is passing it on to me to use for charity quilt backing. YAHOO!! Perfect. This will work on lots of different quilts. I can’t wait to find the perfect top for it. In her note LaNan writes, “I applaud your spirit of giving”. Well I appreciate LaNan’s!! Thanks a bunch. Anyone have a charity quilt top that would work well with this? Send it my way…let’s get it quilted, bound and on it’s way to someone in need. The last box came from California. There was no first name on the address…there was a note. The box was filled with goodies for Kayla. For those of you who don’t know, several blog readers who have Red Heart and other similar yarns they no longer want have donated their unwanted yarn to Kayla. She does a lot of charity knitting and crocheting. She makes some amazing things. Here’s a link to Kayla’s post about her charity knitting. I’m not sure who to credit the amazing gift to….I can’t read the name in the signature. Can you? Kayla is going to love all the magazines. She never buys them for herself so they will be a super treat. Thanks so much to all who thought of me and Kayla. We both so appreciate it. I’m hoping Kayla is home soon so I can get this to her. She’s going to love it! !